Twenty years after the first Independence Day invasion attempt, Earth is faced with a new alien threat. Will mankind, including those who helped stop the first attack, be able to triumph this one? 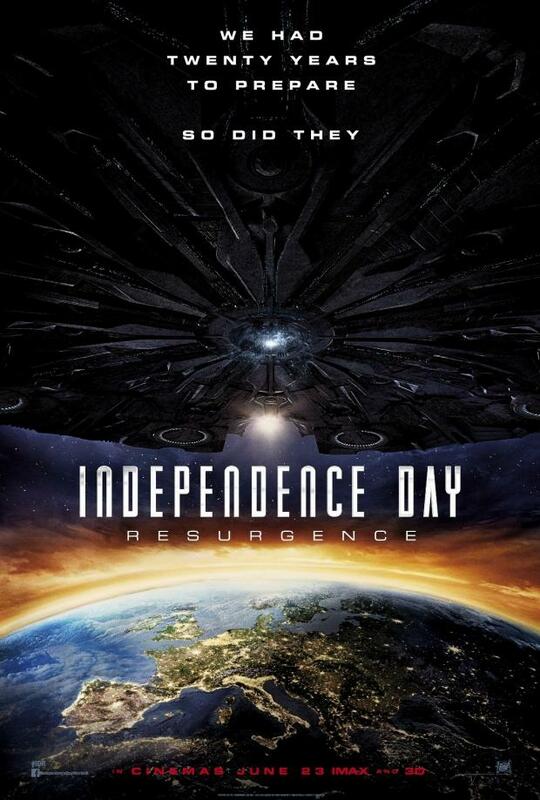 Independence Day: Resurgence is the long-awaited sequel to 1996’s Independence Day and a lot of the original cast is back, as well as a lot of new characters. That in itself is a bit of a problem. Original characters like President Whitmore (Bill Pullman) and his daughter Patricia (Maika Monroe), go-to alien-expert David Levinson (Jeff Goldblum) and his father Julius (Judd Hirsch) all return and then you have new characters like pilots Jake Morrison (Liam Hemsworth), Dylan Hiller (Jessie T. Usher) the son of Will Smith’s Captain Steven Hiller and Rain Lao (Angelababy) and then there’s scientist Catherine Marceaux (Charlotte Gainsbourg) and a lot of children – a school bus-full of them. The film struggles to give the runtime to all these characters, it tries to give them each an emotional moment or character arc but it doesn’t work a lot of the time. Independence Day: Resurgence is also a bit slow to get going. It has to set up all the aforementioned characters and the type of world they’re in now that humanity has pulled together and has used the alien technology to improve their own. Plus, there’s this whole bit in Africa with David Levinson at the beginning that almost feels like it’s just a reason for him to be away from America when everything really kicks off. That being said, the effects are pretty spectacular and the action-sequences are thrilling – though when there’s dogfights in the air it’s a bit difficult to keep track of which planes are the good guys since humans have combined human technology with alien tech. No one quite does worldwide destruction like Roland Emmerich! Independence Day: Resurgence is mostly entertaining but doesn’t live up to the original. While it still has some humour, it doesn’t always hit the spot and I think the film misses the charm and charisma that Will Smith brought to the original. 3/5. I really enjoyed the first movie when I was a kid, but I have no real interest in seeing the sequel. Great review! This is a very well put review! A great read.